The US military enlists the help of a linguistics professor (Amy Adams) and a physicist (Jeremy Renner) to communicate with an alien race to find out their purpose on earth. "Arrival" is directed by Denis Villenueve with a screenplay by Eric Heisserer. This film is based on the short story called "Story of My Life" by Ted Chiang. 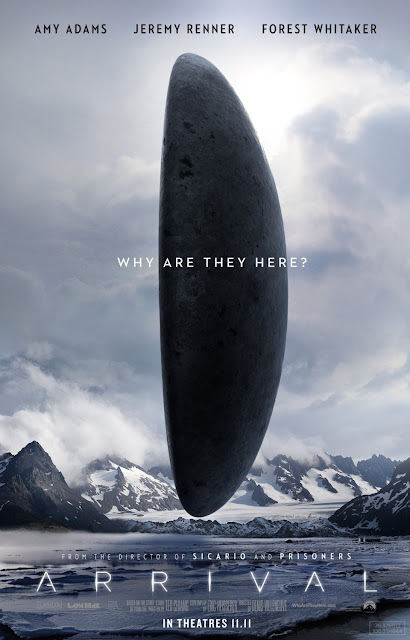 It stars Amy Adams as linguistics professor Dr. Louise Banks who, after the arrival of UFOs at 12 locations around the world, is tapped by Colonel Weber, played by Forest Whitaker, to help translate the alien language. Joining them is Jeremy Renner, who plays theoretical physicist Ian Donnelly, who is also assisting with the alien language and to discover why they are here. This is the type of film that is hard to talk about without spoiling everything. Even trying to explain the narrative would be a spoiler in a sense. What we can say is this is a dramatic sci-fi film that is really more about philosophy than it is about science. The less you know going in, the better. It is not really a study of the observable, but an exploration of the existential. It has a strong focus on language and communication with the excitement and pacing of a lecture on the subject. In other words, the pacing is slow and methodical, but if you know anything about director Denis Villeneuve and his past works, "Arrival" falls right in line with his other films. Villeneuve makes the audience wait for details, doling them out ever so slowly, and his pacing and storytelling are a direct reflection of this methodical crafting. Usually in films such as this, this slow pacing is building to some ultimate climax, but here, it never really comes for us because we figured out the ultimate reveal long before it is divulged. 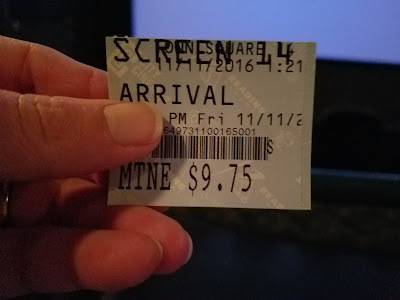 That being said, every other aspect of "Arrival" is sheer genius in terms of look, feel, acting, directing, and aesthetic. Villeneuve and his team create some breathtakingly beautiful imagery when it comes to cinematography and visuals. The creature design and the design of their ships is simple, but also interesting and well created, especially their written language, which is a keystone of the film. The way Villeneuve and cinematographer Bradford Young play with light and shadow while musician Jóhann Jóhannsson messes with the sound, is world's above what other filmmakers are doing. The people behind this project are creating a full-scale art piece, not just a bunch of clamoring pretty pictures thrown together willy-nilly. All of the sounds and sights have a purpose, and that purpose means something in the end. The acting, though subdued, is nuanced and rather wonderful, especially from Amy Adams. She and Jeremy Renner also have an excellent chemistry. Even when words and emotions are not spoken out loud, we get the sense that their bonding is greater than it appears. Forest Whitaker is always fantastic, but unfortunately, Michael Stuhlbarg is wasted here, more of a throwaway governmental type of character than anything. Though we personally enjoyed "Arrival," this is the type of movie won't be for everyone as it is really an arthouse film disguised as a big blockbuster. It's far less alien, far more human, and this very fact will put some moviegoers off entirely. Us? We're totally fine with it, and it's not that we don't understand what it's trying to say, we just don't feel like it's this big unifying masterpiece everyone is making it out to be. The pacing and overall themes may leave some struggling to stay engaged and/or awake. We wish we had liked this a little more than we did, but it's still refreshing to see a big blockbuster type of film led by a director who takes chances and risks when making his art. My husband and I really enjoyed this movie. It was so good and well directed. Have you watched any of Villeneuve's movies? Sicario was one of our top 5 favorite films last year! We're so glad you guys enjoyed this one!! Better than expectation which is rare.cutting edge references about our basic concepts of time and our preconceptions about life and existence. .
We totally agree! Denis Villeneuve really makes spectacular films that make you think and question everything you know!